Configuration: 11 packs per box. 8 cards per pack. 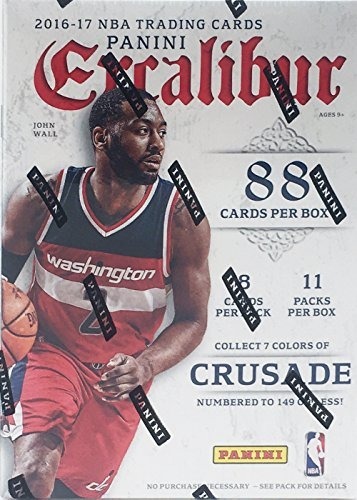 Excalibur showcases a 200-card base set with a brand new design featuring full bleed action photography, and specifically themed and designed inserts! 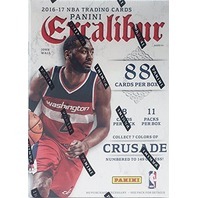 Find Opti-Chrome Crusade cards in every SKU: Silver, Blue (#’d/149), Red (#’d/99), Purple (#’d/49), Orange (#’d/25), Gold (#’d/10), Black (#’d/1)! Look for Kaboom cards, one of the most popular inserts of the release year! Excalibur features randomly inserted autographs of both players and the most recognizable announcers and analysts in the game! 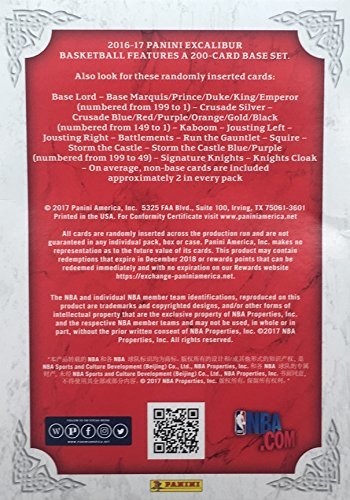 Collect exclusive die-cut insert Storm The Castle with Blue & Purple parallels!